Gone Marama Bale Na Roko Tui Dreketi, Ro Teimumu Kepa (Right). The vanua o Ba has formally accepted the descendants of the Girmityas who will now be known as Luvedra Na Ratu. This is after a veisa ceremony (traditional exchange) took place during the vanua o Ba Festival in Nadi yesterday. 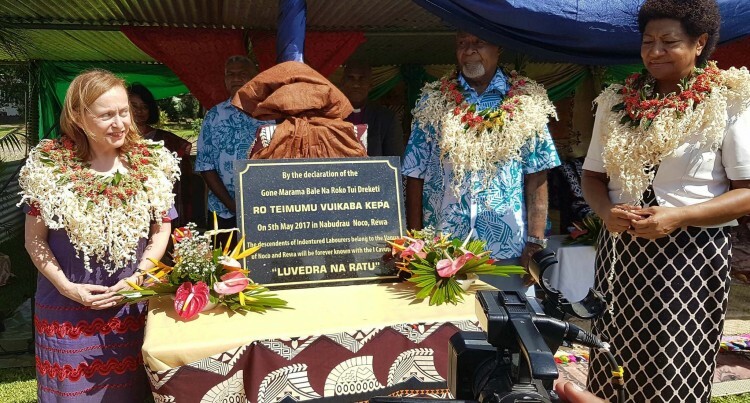 Earlier in May, the people of Noco with the endorsement of the Gone Marama Bale Na Roko Tui Dreketi, Ro Teimumu Kepa had formally accepted the descendants of Indian indentured labourers who were given the title Luvedra na Ratu. Speaking on behalf of the Girmitya descendants, Sashi Kiran said their communities have always desired to belong. “Many have yearned to be part of the vanua and today (yesterday) you have opened new doors and opportunities to enter a new relationship,” she said. Ms Kiran said most descendants were born in Ba and have deep connection with the vanua o Ba. Tui Noco Ratu Isoa Damudamu who was also present at the evert said they are hopeful that other provinces would take the next step and be a part of the initiative. “They are part of our families, tikina, yasana and vanua and together we have to take the next step to help build up our nation,” Ratu Isoa said. Head of the European Union (EU) Delegation for the Pacific, Ambassador Julian Wilson observed that communities that work together and build on what they have in common can progress. Mr Wilson said the dialogue releases the incredible power of participation and co-operation.